When the petals of the wild roses fall in the lush mountain valleys of South America the berry-like hips of the flowers seedpods are collected. The rose hips of the Rosa Affinis Rubiginosa are used to make a myriad of healing and beauty products such as oil, tea, moisturiser, face masks, toners and spot treatment creams. The finely ground powder of rosehip seeds can be also used as a natural exfoliator to remove dead skin cells. Rosehip oil has a list of healing benefits as long as a thorny stem. It's packed with essential fatty acids (linoleic, linolenic and oleic), anti-oxidants (tocopherols or Vitamin E is a naturally occurring preservative), retinoic acid (a derivative of Retinol or Vitamin A), Omegas 3 and 6 and Vitamin C.
The therapeutic rosehip oil aids the regeneration process of our skin's cellular membranes and the repair of damaged tissues. Some studies have found that when applied twice daily to scars (recent or not) they have become less visible and the skin more elastic. It has also been reported to return burn tissue to its natural colour. 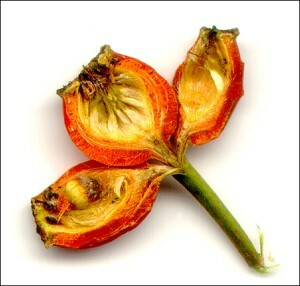 Rosehip can be used to reduce the appearance of stretch marks and acne scars by massaging into the skin. It can help the skin heal sunburn, inflammation, dermatitis and eczema by restoring the skin's moisture balance. When applied to coloured, permed and sun damaged hair it has been noted to have similar effects. This skin healing gem can also lend a hand to those of us trying to slow the aging process by aiding the repair of tissue to reduce fine lines and pigmentation. Rosehip oil makes for an excellent ingredient in moisturizers as it is ultra-fine, enabling the skin to absorb it very quickly. It also loosens the tension in the skin leaving it softer, smoother and more vibrant looking. Complete ranges of pure skincare based on Rosehip Seed Oil are made by Trilogy and Barefoot SOS. If you need any advice choosing what's right for your skin don't hesitate to get in touch.